In this article we are going to demonstrate how to create a public anonymous chat application on iOS. This will hopefully show you how easy it can actually be to create your very own chat application and also how you can use Pusher to integrate some real-time functionality into it. This article assumes you already have a working knowledge on Swift and XCode. You will also need to have a Pusher application set up. You can get a free Pusher account by clicking here. Our application will be a highly ephemeral application that does not save state. We will be using Pusher to send the messages and listen for new ones on the application. We will also build a web app using Node to be the server side app that handles the Pusher event triggers. 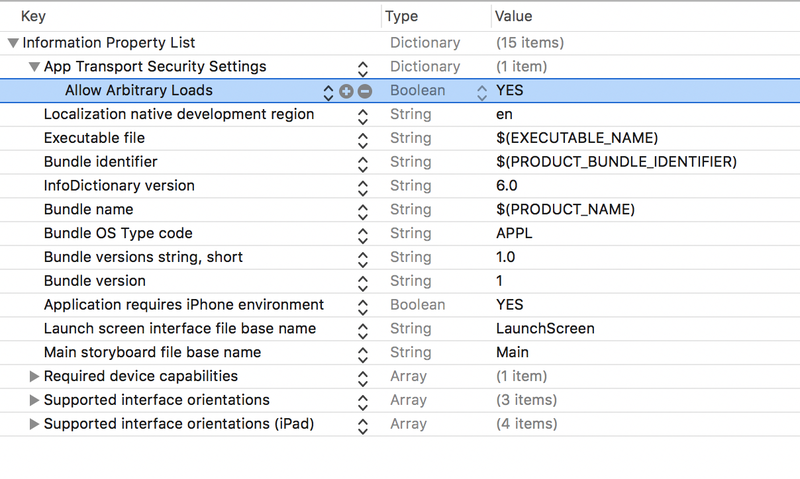 The first thing you will need to do is create a new XCode project. When you have created a new project we will use Cocoapods to manage the dependencies the application might currently have. If you have not done so already, install Cocoapods on your machinne. This will create a Podfile and this is where we will define our dependencies for the application. After you are done, run the command pod install and this will download the dependencies specified in the Podfile. When this is complete, close XCode (if open) and then open the .xcworkspace file that is in the root of your project folder. For login, we have decided to keep it simple. Since this is an anonymous chat application, we will generate the username for the user internally. Create the login view using the storyboard interface builder. Below you can see what I have created using the builder. The "Login anonymously" button would be the trigger to push the next controller in. The next controller is a navigation controller. This will be the one loaded after the login button is clicked. This in turn has a root controller which is out ChatViewController and this extends the JSQMessagesViewController which will give us the chat-like interface automatically. Neat right? Now that we have created the views and interface necessary to work with the application, we need to write some code. 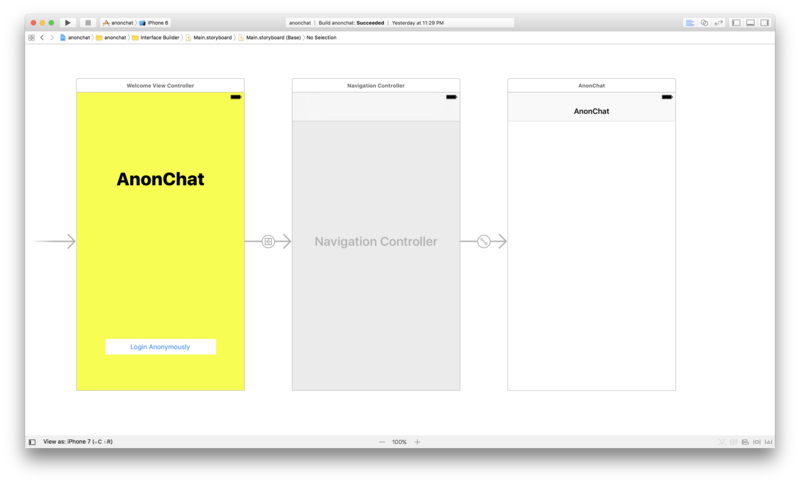 Create a ChatViewController and associate it to the chat view that we created above. Now let us start adding functionality to the controller. First, we want to add a messages array that will contain all the messages in this current session. Then we will create a Pusher instance that will listen for new messages and then append the message to the messages array. So above in the viewDidLoad method, we called listenForNewMessages which does as it is titled and listens for new Pusher events/messages. Then it calls the addMessage method which appends to the messages array. The next thing we want to do is customise our chat interface using the JSQMessagesViewController class we are currently extending. This will create a username 'anonymous' plus a random number between 0 and 999. That should suffice for now. The final piece of the puzzle now is adding the postMessage method which will post the message to our Node application backend. That application will send the message down to Pusher and it will be ready for pick up by any listener on that Pusher channel. We will be using local host but if you already have it online that is great too. Now that we are done with the iOS and XCode parts, we can create the NodeJS back end for the application. We are going to be using Express, so that we can quickly whip something up. Once you have your local node webserver running, you will need to make some changes so your application can talk to the local webserver. 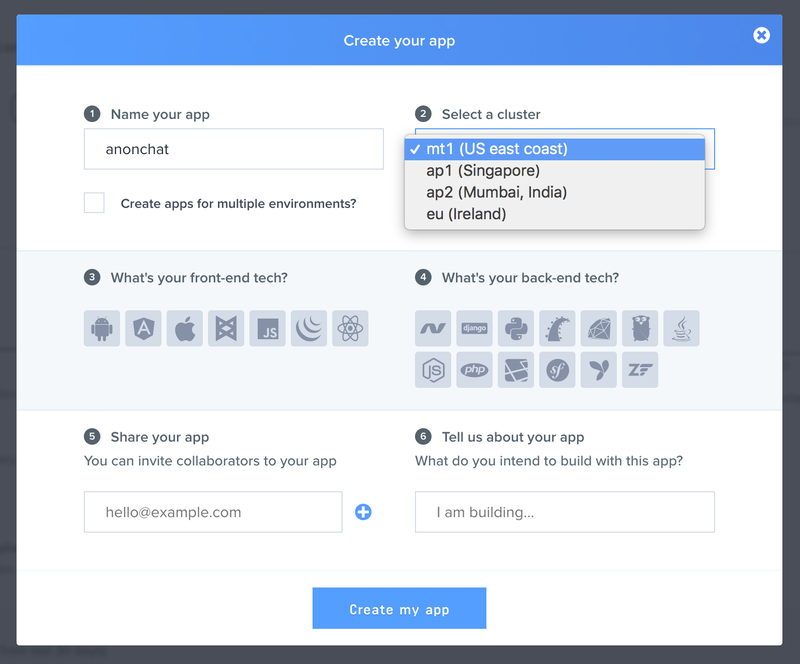 With this change, your application can now talk directly with your local web application. We have created an application that works as a public chat application on iOS using Swift and Pusher. If you want to, you could expand this application to have a typing indicator feature and a delivery status.